2 Bedroom Flat To Rent in London for £5,200 per Calendar Month (Calculated). SHORT LET: This wonderful two bedroom apartment would make the perfect stay for any visitor to London. The property sits on the raised ground floor of a stunning stucco fronted villa and located on a prime residential street within the very heart of Notting Hill. 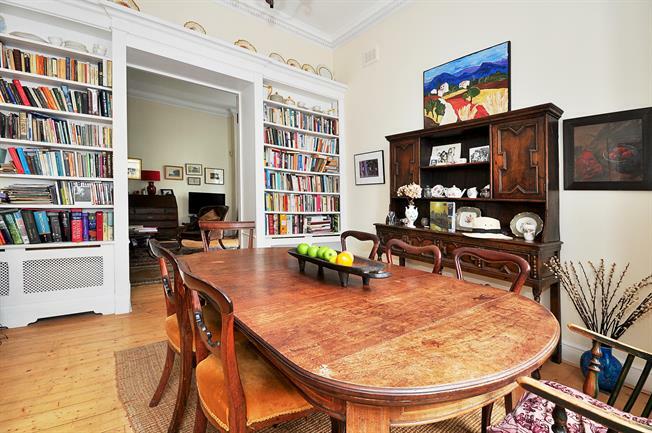 The property offers plenty of character, incredible high ceilings, large sash windows, wooden floors and an eclectic interior. The property boasts a delightful reception with floor to ceiling windows overlooking the stunning communal gardens - to which residents have direct access. The reception leads through to a beautiful dining room (perfect for entertaining) and separate modern kitchen complete with dishwasher, fridge/ freezer, gas cooker. The flat further comprises a spacious master bedroom with excellent storage and en suite limestone bathroom (boasting separate bath and shower), further double bedroom with fitted wardrobes, a recently refurbished family bathroom and finally a utility cupboard with separate washer and dryer. Stanley Gardens sits in the very heart of Notting Hill and is ideally situated for Westbourne Grove and Portobello Market with their wonderful array of vibrant shops, cafes and restaurants and a short walks brings you to the calming green open spaces of Kensington Gardens and Hyde Park. Excellent transport links are also on the doorstep with an abundance of bus routes and direct links to the City via Notting Hill Gate underground station (Circle/ District & Central lines).